I saw this recipe in the November issue of Cooking Light and the lentil-pumpkin combination really appealed to me. 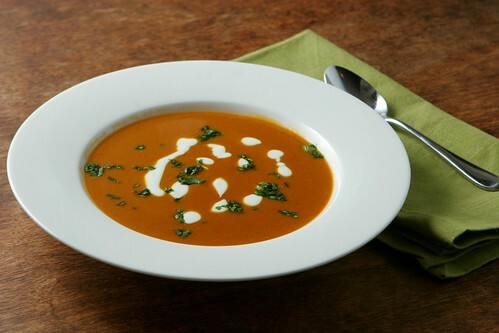 I have always enjoyed lentil soup and the addition of pumpkin just seemed like it would work well. I ended up making this soup for dinner tonight and was really happy with it. This is a great soup for fall/winter - it's healthy, filling, and flavorful, and also happens to be quick and easy to make. 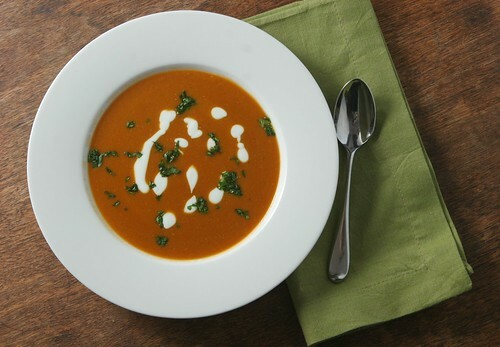 The pumpkin adds creaminess and a hint of sweetness to the soup, and the spices are well balanced. The recipe uses mostly pantry ingredients, so this is something that you can easily whip up when you're looking for a warm satisfying meal on a winter night. Heat a medium (3 quart or so) pot over medium-high heat. Add canola oil to pan. Add onion and garlic and saute until soft and just beginning to turn golden, about 5-6 minutes. Add 3 cups broth, lentils, cumin, and red pepper to pot and bring to a boil. Reduce to a simmer, cover pot, and simmer until lentils are tender, about 10 minutes. Remove pot from heat and puree mixture with an immersion blender until smooth (or transfer to a regular blender). Return pureed mixture to a simmer over medium heat. Add remaining 1 cup broth, 1/2 cup water, pumpkin, ginger, and lemon juice and stir to combine. Cook for a few minutes until soup is fully heated through. Season soup to taste with salt and freshly ground black pepper. Ladle soup into bowls and top each serving with yogurt and chopped cilantro. Mmmmmm.... this soup looks warm and comforting. this looks simply delicious, and i'm certainly glad i have some red lentils and pumpkin hanging around! What a gorgeous and healthy soup. Yum yum! I love the two soups separately, too - combining them in once recipe is such a great idea! Yum! Although they play more of a festive role in today’s society, pumpkins contain a large number of health benefits that would make it wise for us to incorporate them into our diet.